Nothing says summer like grilling outdoors. And whether it is a thick steak, pork chops, chicken, or fish, some of these ingredients can be expensive, so knowing how long to cook each type of meat to your liking is crucial. There's nothing worse than overcooking that pricy porterhouse! You also need to make sure that the chicken, hamburgers, and seafood are fully cooked to a safe internal temperature before serving. Whether you are using a gas or charcoal grill, following a few steps when grilling and knowing how long to cook the particular food will help assure a successful outcome. Grilling may seem as simple as throwing some meat on a hot grill, but it is actually a bit more involved than that, and there are a few tips to keep in mind before you start. First, it is important to clean the grill, using a brush with stiff bristles or a crumpled up piece of foil, to remove any leftover residue. Then you should oil the grill rack lightly before adding the meat. Once you place the food on the grill grate, let the meat stand, covered or not, until it releases easily before flipping or moving around. You want to make sure there are beautiful grill marks on the meat. 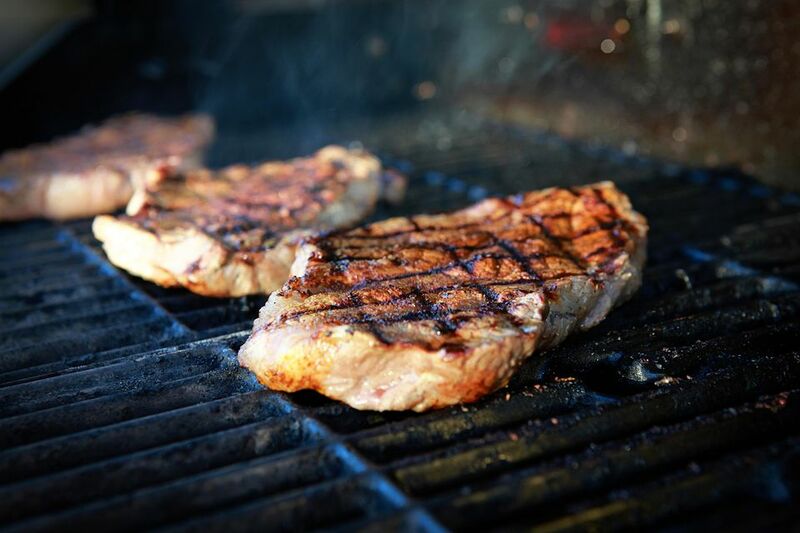 Once the food is done, you need to let it rest; grilled meats such as steak, pork chops, tenderloin, and chicken should have a standing time after grilling which raises the internal temperature a bit and lets the juices redistribute. Place food on a clean plate (not the plate you used to carry the meat to the grill), cover loosely with foil and let stand for 5 minutes. If you are using a charcoal grill, be sure the coals are covered with light ash before you start cooking. Most meat, chicken, and fish should be grilled over medium coals which means you can hold your hand about 5 inches from the grate for 5 to 7 seconds before you need to pull it away. Steaks can be cooked to any desired doneness, but for food safety reasons, make sure they are at least 140 F, or medium rare. Pork and lamb can be cooked to 145 F, according to information put out by the USDA. Ground meats—whether beef, turkey, or chicken—must be cooked to 165 F to kill bacteria. Grilling times depend on a few factors: the type of food, its thickness, and desired doneness. Once you fill in these blanks you can easily figure out approximately how long you need to keep the food on the grill; we say "approximately" because time is not always the best way to judge if food is done. Having a meat thermometer—or even the cooking probes that now come with many grills that are wirelessly connected through an app on your phone—is very helpful and will offer an almost foolproof method for testing doneness. That being said, you can use the different grilling charts as a guide to make sure you serve a perfectly grilled dish every time. There are different methods when grilling steaks versus grilling roasts. To create that nice outer crust and visible grill marks on a steak, you need to sear it first, which means cooking it briefly over high heat. Then to bring the interior to the proper temperature—without charring the outside—the steak should be moved to a lower heat until the desired doneness is reached. Searing should take 2 minutes for a 1-inch-thick steak and 4 minutes for 1 1/2 to 2 inches thick. (The cooking times for steak include the searing times and the steaks should be flipped halfway through the cooking time.) Most of the steak thickness listed is 1 inch—simply add 5 minutes cooking time for every 1/2 inch of thickness. For roasts, the cooking technique is indirect heat, meaning you need to place the meat to the side of the fire and not above. The roast should be fat-side up; use a meat thermometer to test for doneness. Of course, this list wouldn't be complete without mentioning hot dogs and hamburgers. Most hot dogs are packaged already cooked, so they only need a few minutes (5 to 7) on the grill to get hot and a bit of char. Hamburgers should be seared over high heat for 2 minutes on each side, and then add 2 to 3 minutes for every level of doneness (so add about 4 minutes for medium and 6 minutes for well done). Pork chops and steaks should be cooked over direct heat (although thicker cuts can be moved to indirect heat to finish cooking) and flipped halfway through. Roasts should be cooked over indirect heat, placed fat-side up, and cooked to medium (versus well done) for best results. For a tenderloin, cook as you would a steak (including searing) until the internal temperature reaches 145 F.
When it comes to grilling any kind of poultry, everything except whole birds should be cooked over direct heat. Flip the poultry halfway through cooking time, and if you are adding a sauce to the chicken or turkey, do so in the last 10 minutes of cooking time. Make sure the whole birds are fully defrosted before grilling. Cooking seafood often needs a bit more attention as a beautiful piece of fish can go from moist to dry in minutes and shellfish from tender to chewy in no time. 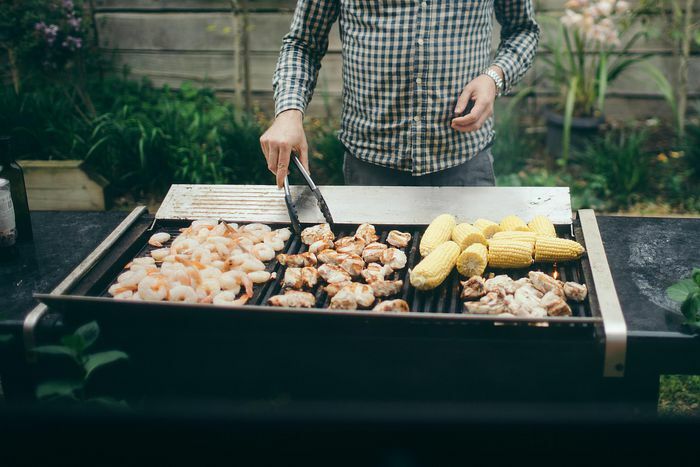 Whether you are grilling fish steaks, fillets, whole fish, or shellfish, there are a few general rules to follow: For most fish and shellfish use a medium-hot grill; however, if cooking whole fish, grill over low heat while peeled shrimp, calamari, and scallops should be on a hot grill. Treat tuna steaks as you would a beef steak and sear it first, then cook over medium heat.